The picture below shows a 2019 T-Shirt Jurby Help the Isle of Man TT Helicopter Fund Size X-Large (Chest 46-48 inch). Thousands of other top quality spares listed on our website at refreshingly low prices. Support a great charity and look stylish at the same time! Every year for the last four years, we have released a new Festival of Jurby T-shirt, celebrating the popular late-August event in the Isle of Man. 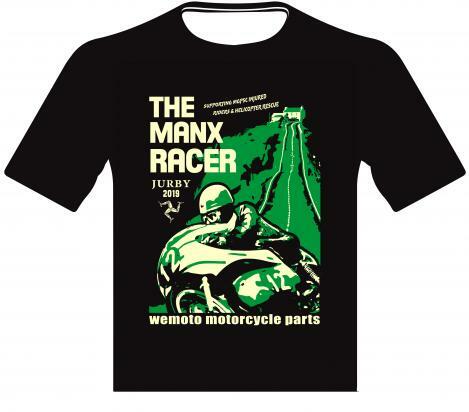 The profits from the sale of these t-shirts are given to the Manx Grand Prix Supporters' Club. The club uses the money to help fund its life-saving helicopter ambulance used during the Manx Grand Prix and support injured MGP riders and their families. Created by our in-house designer, this year's t-shirt sports a vintage racer at the iconic Kate's Cottage part of the Isle of Man Snaefell Mountain Course. The fund has been endorsed and supported by racing legends such as John McGuiness and Guy Martin, and by other big names in the motorcycling industry, Henry Cole and Ross Noble to name but a few.